Folks, in the spirit of keeping it real.. I live in Georgia. While we do have a few days of winter dip below freezing, the stretches of cold air don’t last that long and I don’t think it’s ever been below zero in my lifetime. I could be wrong, but I doubt it. Add to that the fact that it’s not easy to find real winter wear & gear in the south, and I have a lot of photos showing exactly what you shouldn’t be wearing when you visit Clingman’s Dome in November (Honestly, we were just ill-prepared for our spontaneity that day}. Snow excites us so much, that I have barely ever thought to grab my camera when the boys want to build a snowman snowdwarf in our 1-2″ of snow a year. Mother Nature brings the cold wintry weather.. we bring the gear that keeps us warm! These 11 tips have been compiled from the lives of some experienced outdoor families living and playing anywhere from the southern states to Canada. Let’s kick this off with..
Cotton kills by creating conditions that initiate hypothermia. Hypothermia is a potentially deadly condition that occurs when your body’s temperature drops below 95 F (35 C). Watch this video to see the difference between jeans and hiking pants in below-freezing conditions and read this important article to learn more about how cotton kills. The article lists synthetics and merino wool as comfortable alternatives to cotton. Layering is a concept with which most folks are familiar, even us southerners. Put a long sleeve shirt over your tshirt or some pants over your thermal underwear, right? Well, the folks in colder climates have this technique mastered to a science. Amelia, from Tales of a Mountain Mama, relies on a layering system built around base, mid and outer layers depending on the temps. For general wintry weather, like we might experience in the south, she recommends a quality base layer, fleece mid-layer and wool socks. Read more about her bundling regimen. Kate, from Wild Tales Of, sporting the baby carrier cover. OK, it doesn’t necessarily have to be below freezing. I just thought that had a catchy ring to it. These tips are specifically for the babies and toddlers in strollers or carriers. Keep those little toes warm and toasty! If you’re layering on clothes to keep warm, add an extra layer for baby. Cragmama, Erica, reminds us that our babies and toddlers aren’t generating as much warmth, through intense activity like hiking, while they ride along in their carriers. They’re also playing closer to the cold, damp ground when they’re on their feet. So, while you may begin to feel warm, they may need an extra layer against the cold. Kate, from Wild Tales Of, introduces us to a totally neat babywearing carrier cover that adds another layer of insulation for baby. The carrier cover, made of weather-treated Polartec fleece, is recommended in temperatures as low as 15 F (-10 C) and works with all soft carriers with the child being worn in all positions. Check it out! Coping with the cold is not always easy, but it’s worth it to get outdoors and enjoy what little sunlight we have during the winter. Watch this video, by ActiveKidsClub, to see how it’s done. Cope with the bitter cold by adding to your winter wardrobe a hat that covers ears or using a ski mask, using hand and foot warmers, bringing an emergency blanket and a change of socks and mittens like Adventurous Parents, Cragmama, and Tales of a Mountain Mama. My personal favorite tip is to, “turn on your inner furnace,” by eating trail foods high in protein and fats. Thanks, Cragmama! Bring a thermos of warm tea, nuts, cheese and Clif Bars. Clif Bar recently sent me a Thanksgiving Care Package when I told them I didn’t know how to make turkey (that’s not what I actually said). But, check out this feast of flavors. My son’s favorite are the Iced Oatmeal Kids ZBars, although he has recently been nabbing my seasonal Gingerbread and Pumpkin Pie bars. It’s important to remember that there isn’t a one-size-fits-all system for comforting all of your family against the cold. Each little body has their own preferences and we have to remember to check-in with them to discover what’s working and what’s not for each individual. If the child is too young to voice their opinion, you can touch their skin, notice the coloring of their faces, and be aware for signs of discomfort or distress. 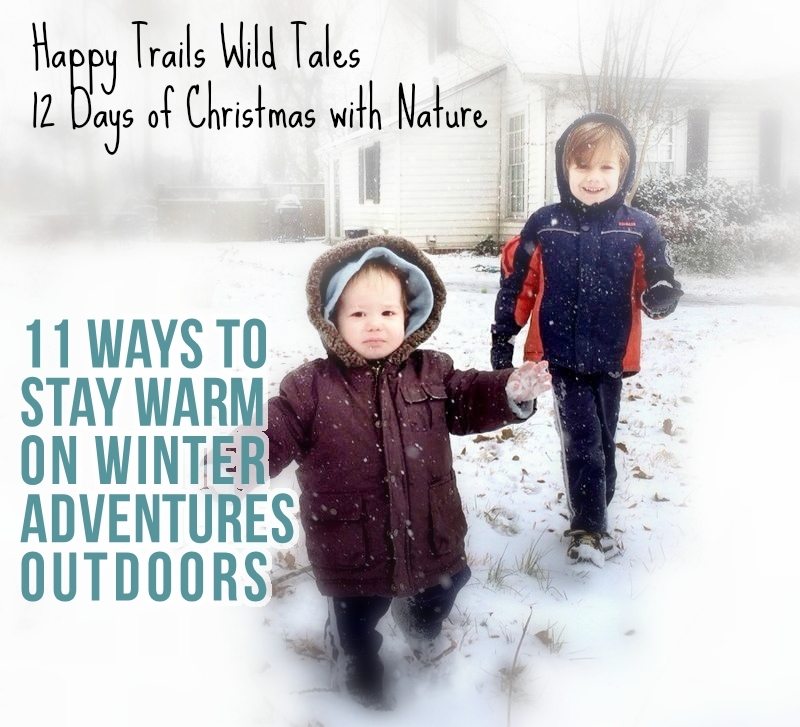 Enjoy your winter outdoors with more 12 Days of Christmas with Nature! Thanks, 365 Atlanta Family for the title photo! 12 Christmas Tree ornaments made from nature! You did such a great job bringing together the various posts! I agree with all of the above. Where I live, the first snowfall is around Halloween (but it was in mid September this year!) and the last is around end of May, so we have invested a lot in winter gear so the kids can stay warm, stay safe, and have fun. : ) Waterproof and windproof fabrics are important when little ones spend so much time on the ground (rolling in it, laying in it, and sitting in it). The part about eating made me chuckle, but you’re right on the money! If you’re well fed and hydrated, you stay warmer! When it’s really cold, I bring my 87 g backpacking campstove and a small pot so I can make hot chocolate on the go. A hot drink makes all the difference on a cold day. Looking forward to more days of Christmas! Thanks, Karen, for the extra tips! They are greatly appreciated. I like the idea of bringing the backpacking campstove for a quick heat up.